Some interesting details regarding the next generation Intel Skylake platform have been revealed by VR-Zone. The details show that the x86 Skylake architecture which would be based on a completely new 14nm node will feature several enhancements and will be supported by a new chipset, details of which are provided below. The first thing we are most excited to learn is that Intel Skylake processors would be compatible with the latest 100 Series chipset which will replace the (soon to launch) Z97 and H97 chipsets which will be part of 9-Series chip-sets. This means that the upcoming processors will require a new motherboard that features the 100-Series chip-set and we will probably see a new socket too that replaces the current LGA 1150 socket. This is good news but this also means that current users or those who are upgrading to Z97 soon will have to upgrade their PCs again moving in 2015 if they want to take advantage of the new processors and DDR4 memory. It should be pointed that the Intel will launch their Haswell Refresh processors on 10th May followed by Devil’s Canyon on 2nd June 2014 which is the codename for the Haswell Refresh K-Series featuring better TIM between the IHS and CPU die to circulate heat efficiency and better packaging components so that they can overclock to more extent as compared to Haswell. Soon after Haswell, we will see the launch of Intel’s HEDT Haswell-E plat-form which will replace Ivy Bridge-E and introduce DDR4, X99 Chipset and the latest LGA 2011-3 socket based motherboards. Moving in 2014, we will see the first 14nm Broadwell processors for desktop in Q1 featuring the support on current Z97 chipset motherboards. 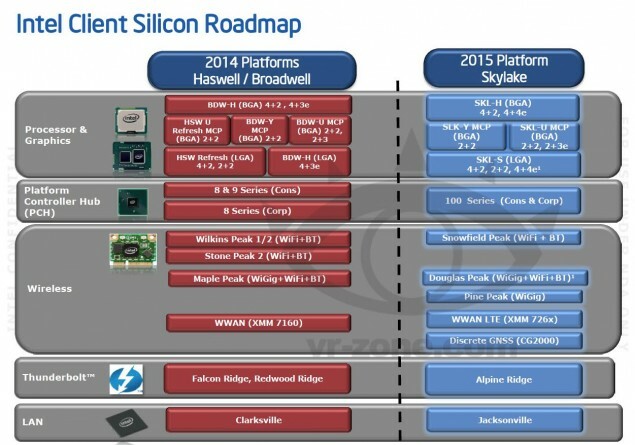 The platform roadmap pits Skylake desktop parts in 2015 which means that Broadwell would be short lived and we probably won’t see a Refreshed platform like Haswell for Broadwell and instead move directly towards the Intel Skylake processors which will feature new architectural enhancements compared to Haswell and Broadwell.